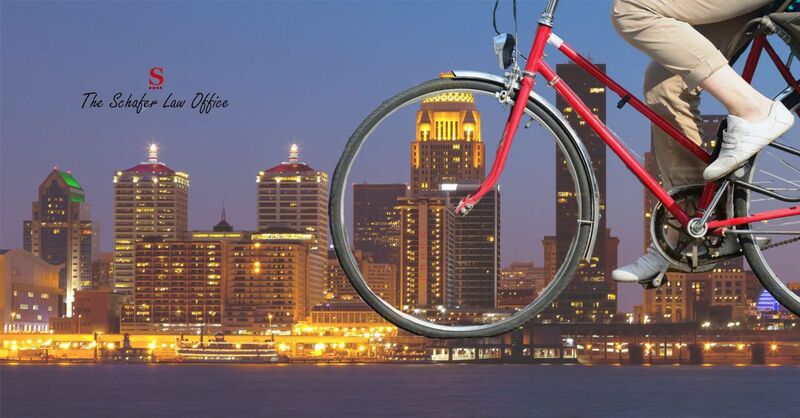 Bicycle Accidents | Louisville, KY If you have been in a bicycle accident in Louisville, KY, call 'The Lawyer Who Wrote the Book' Mike Schafer. Do you have questions about your bicycle accident case? The attorneys at The Schafer Law Office have the answers! What Are The Differences Between A Bicycle Accident And A Car Accident? Do Bike Lanes Really Protect Me While I Ride My Bike? Call 9-1-1 to report the bicycle accident as soon as possible. Police will come to the accident scene and file an accident report. If it’s safe and you are able to do so, gather as much information from the accident scene as possible. You’ll want to get the other party’s name, phone number, address, license plate number and make and model of their vehicle. If you have a camera or smartphone, you will also want to take pictures. Take pictures of the accident scene, damage to your bicycle, other vehicles involved, license plate number, and people involved in the accident. Do NOT put your life at risk to gather information or take pictures of the accident scene. The police report will have many of these details recorded for you in case you aren’t able to gather evidence. Even if you feel fine after the accident, you need to see a doctor right away. Some injuries aren’t visible right away. By seeing a doctor, they will help diagnose your injuries. Also, if you feel that legal action is necessary, you should consult with a personal injury attorney. They will help you get compensated for your injuries. How are bicycle accidents different from a car accident? Your medical bills are paid by the insurance company of the car that caused the accident up to $10,000, in most cases. The cyclist is exposed to their surroundings. Your injuries are likely to be more severe. How are bicycle accidents the same as a car accident? The person that caused the accident is responsible for compensating you for your injuries. The injured person can go to the doctor of their choice. The person that caused the accident will pay to fix your bike and any other property damage. The insurance company will evaluate and pay your claim based on a computer program. Bike lanes are meant to keep vehicles away from cyclists. While this doesn’t always happen, bike lanes give cyclists their own space to ride. Studies have shown that bike lanes improve safety for both motorists and cyclists. This is because drivers can pass a cyclist without having to swerve into the other lane to get around the cyclist. This is also good for the cyclist because they don’t have to hug the side of the road as much as on roads without bike lanes. Hugging the side of the road may make a cyclist feel safer, but it is harder for other vehicles to see them. Car doors. Bike lanes put the cyclist towards the side of the road. If there’s street parking, there will be parked cars on the road. This could mean someone opening their car door when you’re getting ready to pass, causing you to hit their door. Turning cars. Cars are not allowed in bike lanes. However, if a car is making a right-hand turn, they could enter the bike lane. Debris. Bike lanes are normally towards the side of the road. This is also a common place to find debris like rocks, broken glass, and trash. Hitting any of those could cause your bicycle to flip or cause a flat tire. Familiarity. Many driver and cyclists are not familiar with bike lanes and do not use them properly. Always wear a DOT approved helmet and other safety gear. Use a front and rear light on your bike. This will make it easier for other bikers and vehicles to see you, especially when it’s dark. Be familiar with the bicycle laws in your area. For example, it's illegal for anyone over 11-years-old to ride a bicycle on any sidewalk in Louisville Metro. Also, no one of any age is allowed to ride on the sidewalk downtown. Be seen. Wear brightly colored clothing if possible. Be predictable. You want other cyclists and vehicles to know your next move, like making a turn or coming to a stop. You can do this through hand signals. Always ride with traffic. Bicycles are considered vehicles. That means they must obey the same rules as cars. If you’ve been injured in a bicycle accident in the city of Louisville or Kentucky, you need to get legal advice as soon as possible. You’ll want to make sure any evidence that will help your case can still be gathered. You’ll want to make sure that the evidence is not destroyed. A bicycle accident attorney can help you understand your case and Kentucky law. You want an attorney who cares about you. You'll find all that and much more in Mike Schafer, Bryan Meader, and The Schafer Law Office. With Mike Schafer and Bryan Meader on your side, you’ll be in good hands. The Schafer Law Office has been helping personal injury victims get compensated for more than 25 years. Unlike big law firms who will have other people work on your case, Mike or Bryan is personally involved in every case. The Schafer Law Office knows the challenges and pitfalls of personal injury cases (especially in Kentucky), all the tactics of the “other” side and how to best present the facts. They can handle the brutal tactics of the insurance companies. In fact, before Mike opened The Schafer Law Office in personal injury and accident law, Mike worked for an insurance defense firm. They really know all the tactics the insurance companies have up their sleeves. "The Kentucky Accident Book: 7 Potholes That Can Wreck Your Kentucky Accident Case" is a guide to help accident victims who have been hurt in Kentucky.